Athens, Ga. - A team of University of Georgia researchers has developed a new way to breed plants with better traits. By introducing a human protein into the model plant species Arabidopsis thaliana, researchers found that they could selectively activate silenced genes already present within the plant. The research project was led by Lexiang Ji, a doctoral student in bioinformatics, and William Jordan, a doctoral student in genetics. The new method they explored, known as epimutagenesis, will make it possible to breed diverse plants in a way that isn't possible with traditional techniques. "In the past this has been done with traditional breeding. You take a plant, breed it with another plant that has another characteristic you want to create another plant," said Jordan. "The problem with that is getting an individual that has all of the characteristics you want and none of the characteristics that you don't want. It's kind of difficult. With our new technique, you can modify how the genes are turned on and off in that plant without having to introduce a whole other set of genes from another parent." "We saw repeatedly that lots of genes are silenced by DNA methylation and thought it was kind of curious," said Schmitz. "There are lots of discussions you can have about why these exist, but the reality is that they are there. So we wondered, how can we leverage them? Let's use the plant already in the field and reawaken some of those silenced genes to generate trait variation." Figuring out the best way to introduce the protein to the plant species has been a trial and error process. With Ji's expertise in bioinformatics, researchers are able to look at large sets of data about their experiment and make decisions on how to best proceed with the project. "The data has really helped us brainstorm and coordinate what we should do next," said Ji. "That was particularly important in the beginning of this project because we just didn't know what was going to happen with this new technique." "Thousands of years ago you'd plant out hundreds of plants and one of them does really well so you'd breed out generations of that plant. Doing this though, you narrow down the genetic diversity until they're basically very, very similar," said Jordan. "While that's beneficial for yield or other plant characteristics that you might want, if there's a stress that they're not well adapted to because they're all so similar they're all going to respond in the same way. That creates a potentially vulnerable crop." "If they don't have the genetic differences to respond, then it can really wipe out crops," added Schmitz. "This isn't a savior, but it's an alternative strategy that has not been tried before. The idea is to access genes that people haven't been studying because they're not expressed but they're there. We think this method to reactivate these genes could lead to increased trait variation which could be useful for biotechnology applications." 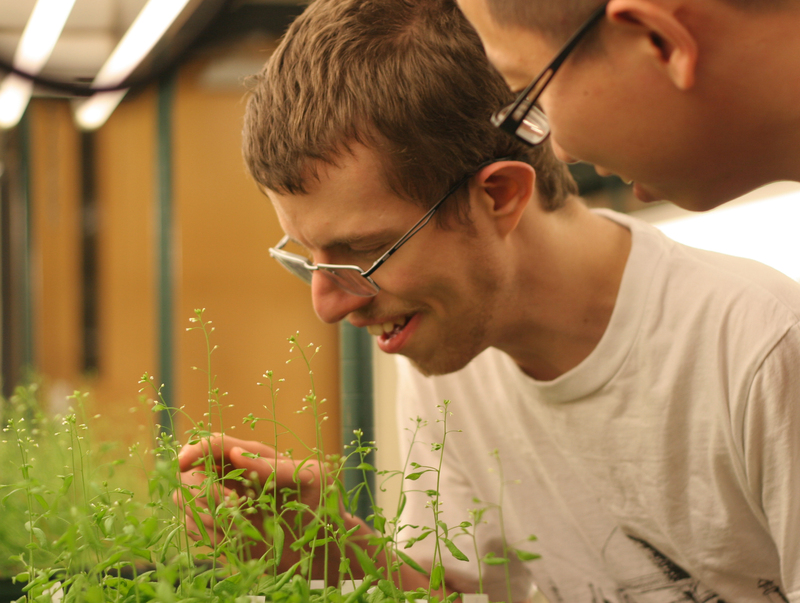 Cutline: William Jordan (left) and Lexiang Ji look over one of many sets of Arabidopsis thaliana, which were used to research a new plant breeding technique.